Methane hydrates are a kind of ice that contains methane, and that form at certain depths under the sea or buried in permafrost. They can also form in pipelines that transport oil and gas, leading to clogging. Yet methane hydrates are nearly impossible to study because it is very hard to get samples, and the samples themselves are highly unstable in the laboratory. That could have important implications for everything from climate science to their use as a future energy source, said Zhiliang Zhang, a professor at the Norwegian University of Science and Technology and founder of the university's Nanomechanical Lab. "If we have basic knowledge about the mechanical properties of methane hydrates, we can use this information so that we manage them properly," Zhang said. "How methane hydrates behave can have a big impact on safety, environmental issues and climate change." Methane hydrates have been known since the 1930s, when natural gas companies found that their pipelines were sometimes clogged by a kind of ice composed of water and methane. Methane hydrates were later found in permafrost in the 1960s, and in the oceans, commonly on the edges of the continental shelves, but only at certain ocean pressures and temperatures. They are also thought to be found on other planets, including Mars. 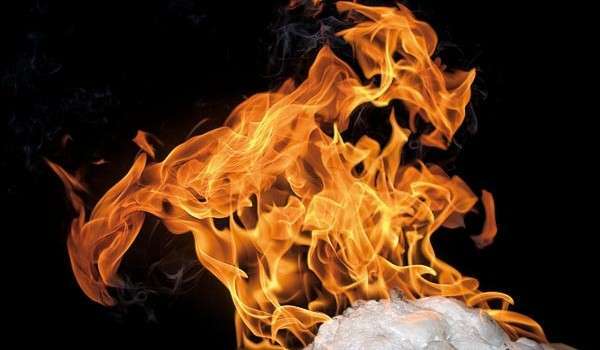 When methane hydrates "melt", they release the methane trapped inside the ice, but because the methane was first trapped under pressure when the hydrate was formed, one cubic metre of solid methane hydrate will release 160 cubic metres of methane gas. That makes them either a potent energy source, or if they melt as the permafrost melts, a potent source of methane, which will act as a greenhouse gas. The slides - there were three in total¬- sent a wall of water roaring out across the North Sea and Norwegian Sea. The evidence of the passage of the tsunami wave in Scotland that shows the wave reached heights of 3-6 metres in that region. One hypothesis for the slide was that an earthquake caused the methane hydrates in the region to become unstable and to explosively release their gas. Researchers at NTNU's Nanomechanical Lab and from the university's Department of Chemistry and their collaborators in China and the Netherlands are interested in understanding the relation between molecular structures and the mechanical stability of materials. Methane hydrates, with their ice lattice structure containing trapped molecules of methane, pose an intriguing three-dimensional and practical problem from this perspective. In a paper published in the 2 November edition of Nature Communications, corresponding author Zhang and his colleagues describe how they used a computer simulation of two types of methane hydrates, monocrystalline hydrates and polycrystalline hydrates, to see what would happen if they were compressed or if pressures on the hydrates were suddenly released. The simulations showed that the size of the crystals—what researchers call the grain size—that made up the hydrate structure had a great deal to say in terms of how the structure reacted to both kinds of stresses. In both tensile and compression stress simulations, the surprising finding was that as the grain size got smaller, the hydrates first got stronger, able to tolerate both compression and tensile stress—but only until they reached a certain grain size. If the researchers conducted simulations on grain sizes smaller than those identified as the turning point, the hydrate actually got weaker. "This has an impact on these big issues," Zhang said. "Here we have taken one step forward, but of course there is a lot more work to be done." Are gas hydrates a source of environmentally friendly energy?